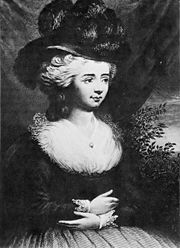 Frances Burney (1752 – 1840), also known as Fanny Burney and after marriage as Madame d’Arblay, was born in King’s Lynn, England, on June 13, 1752, to musical historian Dr. Charles Burney (1726-1814) and Mrs. Esther Sleepe Burney (1725-1762). The third of six children, she was self-educated, and began writing what she called her “scribblings” at the age of ten. She married in 1793 at 42, to a French exile, General Alexandre D'Arblay. Their only son, Alexander, was born in 1794. After a lengthy writing career, and travels that took her to France for over ten years, she settled in Bath, England. Frances Burney was a novelist, diarist, and playwright. In total she wrote four novels, eight plays, one biography, and 20 volumes of journals and letters. In addition to the critical respect she receives for her own writing, she is recognized as a literary precursor to prominent authors that came after her, including Jane Austen and William Makepeace Thackeray. She published her first novel Evelina anonymously in 1778. When its authorship was revealed, it brought her almost immediate fame, due to its unique narrative and comic strengths. She followed with Cecilia in 1782, Camilla in 1796, and The Wanderer in 1814. All of Burney’s novels explore the lives of English aristocrats, and satirize their social pretensions and personal foibles, with an eye to larger questions such as the politics of female identity. Burney never succeeded in having her plays performed save one, largely due to objections from her father who thought that publicity from such an effort would be damaging to her reputation. Edwy and Elgiva was staged but, unfortunately, was not well received by the public and closed after the first night’s performance. Frances was the third child in a family of six. Her elder siblings were Ester (Hetty) (1749 – 1832) and James (1750 – 1821), the younger Susanna Elizabeth (1755-1800), Charles (1757-1817), and Charlotte Ann (1761-1838). Of her brothers, James became an admiral and sailed with Captain James Cook on his second and third voyages. The younger Charles Burney was a well-known classical scholar. Her younger half sister, Sarah Burney (1772 – 1844) also became a novelist, publishing five works of her own. Esther Sleepe Burney also bore two additional boys, who died at birth. Recent Burney scholarship, in particular that of Margaret Anne Doody in her text The Life in the Works, has drawn attention to conflicts within the Burney family that affected Frances’ writing and her personal life. The incestuous relationship of James Burney and his half sister Sarah, which resulted in their eloping in 1798 and living together for nearly five years, was kept from the public, but created a great internal strain on the family. Frances Burney’s mother, described by historians as a woman of “warmth and intelligence,” was Catholic, the daughter of a French refugee named Dubois. Esther’s French heritage influenced Frances Burney’s self-perception in later life, possibly contributing to her attraction and subsequent marriage to Alexandre D’Arblay. Esther Burney died when Frances was ten years old, in 1762, a loss which Frances felt throughout her life. Her father, Charles Burney, was respected not only for his personal charm, but also for his talents as a musician, musicologist, composer, and as a man of letters. In 1760 he moved his family to London, a decision that improved their access to the cultured elements of English society and as a consequence, their own social standing as well. They lived in the midst of a brilliant social circle that gathered around Charles at their home on Poland Street. In 1766, Charles Burney eloped in order to marry for a second time, to Elizabeth Allen, the wealthy widow of a King’s Lynn wine merchant. Allen had three children of her own, and several years after the marriage, the two families merged into one. This new domestic situation was unfortunately fraught with tension. The Burney children found their new stepmother overbearing and quick to anger, and they took refuge from the situation by making fun of the woman behind her back. However, their collective unhappiness served in some respects to bring them closer to one another. In 1774, the family moved again, to Newton House, St. Martin’s Street, in Leicester. Frances’ literary education was stimulated by a family friend, the cultivated littérateur Samuel Crisp. He encouraged Burney’s writing by soliciting frequent journal-letters from her that recounted to him the goings on in her family and social circle in London. Frances paid her first formal visit to Crisp at Chessington Hall in Surrey 1766. Dr. Burney had first made Crisp's acquaintance in about 1745 at the house of Charles Cavendish Fulke Greville. Crisp's play, "Virginia," staged by David Garrick in 1754 at the request of the countess of Coventry (née Maria Gunning), had been unsuccessful, and Crisp had retired to Chessington Hall, where he frequently entertained Dr. Burney and his family. The first entry in her journal was made on May 30, 1768, addressed to "Miss Nobody," and it extended over seventy-two years. A talented storyteller with a strong sense of character, Burney often wrote these “journal-diaries” as a form of correspondence with family and friends, recounting to them events from her life and her observations upon them. Her diary contains the record of her extensive reading out of her father’s library, as well the visits and behavior of the various important artists who paid visits to their home. Frances and her sister Susanna were particularly close, and it was to this sister that Frances would correspond throughout her adult life, in the form of these journal-letters. Burney was fifteen by the time her father remarried, in 1767. Entries in her diaries suggest that she was beginning to feel pressured to give up her writing, which was “unladylike” and “might vex Mrs. Allen.”  Feeling that she had transgressed what was proper, she set fire that same year to her first manuscript, The History of Caroline Evelyn, which she had written in secrecy. Despite this repudiation of writing, however, Frances did maintain her diaries and she wrote an account of the emotions that led to her dramatic act. She eventually recuperated some of the effort that went into the first manuscript by using it as a foundation for her first novel Evelina, which follows the life of the fictional Caroline Evelyn’s daughter. In keeping with this sense of impropriety that Burney felt towards her own writing, she savagely edited earlier parts of her diaries in later life. Burney destroyed much of her own diary material in revising the manuscripts. Editors Lars Troide and Joyce Hemlow recovered some of this obscured material while researching their late twentieth-century editions of the journals and letters. Frances Burney’s first novel, Evelina, or the History of a Young Lady’s Entrance into the World, was published anonymously in 1778, without her father’s knowledge or permission. Evelina was published by Thomas Lowndes, who voiced his interest after reading its first volume, agreeing to publish it upon receipt of the finished work. The novel was rejected by a previous publisher, Robert Dodsley, who refused to print an anonymous work. Burney, who worked as her father's amanuensis, had copied the manuscript in a "disguised hand" to prevent any identification of the book with the Burneys, thinking that her own handwriting might be recognized by a publisher. It was unthinkable at the time that a young woman would deliberately put herself into the public eye by writing, and Burney’s second attempt to publish the work involved the collusion of her eldest brother, who posed as its author to Lowndes. Inexperienced at negotiating with a publisher, Burney only received 20 guineas as payment for the manuscript. Written in an epistolary style, Evelina portrays the English upper middle class from the perspective of a young seventeen-year-old woman who has reached marriageable age. A comic and witty novel, the work is ultimately a satire of the kind of oppressive masculine values that shaped a young woman’s life in the eighteenth century, as well as of other forms of social hypocrisy. Thus, it stands as a landmark in the development of the novel of manners. In choosing to narrate the novel through a series of letters written by the protagonist, Burney made use of her own previous writing experience to recount the protagonist’s views and experiences to the reader. This tactic has won praise from critics, past and present, for the direct access to events and characters that it allows to the reader, and for the narrative sophistication that it demonstrates in reversing the roles of narrator and heroine. The authors of Women in World History argue she draws attention to difficulties faced by women in the eighteenth century, especially on romance and marriage, describing her as a “shrewd observer of her times and a clever recorder of its charms and its follies.” Burney's careful treatment of a female protagonist, complete with character flaws, “who must make her way in a hostile world,” are recognizable features of Jane Austen’s writing, and show Burney’s influence on the later author’s work. The novel brought Frances Burney to the attention of patron of the arts Hester Thrale, who invited the young author to visit her home in Streatham, a center for literary and political conversation. Though shy by nature, Frances impressed those she met, including Dr. Johnson, who would remain her friend and correspondent throughout the period of her visits, from 1779 – 1783. Mrs. Thrale wrote to Dr. Burney on July 22, stating that: "Mr. Johnson returned home full of the Prayes of the Book I had lent him, and protesting that there were passages in it which might do honor to Richardson: we talk of it for ever, and he feels ardent after the denouement; he could not get rid of the Rogue, he said." Dr. Johnson's best compliments were eagerly transcribed in Frances’ diary. Sojourns at Streatham were for months at a time, and on several occasions the guests, including Frances Burney, made trips to Brighton and to Bath. As with other notable events, these experiences appeared in letters to her family. In 1779, encouraged by the public’s warm reception of comic material in Evelina, and with offers of help from Arthur Murphy and Richard Brinsley Sheridan, Burney began to write a dramatic comedy called The Witlings. The play satirized the literary world of London Society, with its pretensions, and especially a group of women known as Bluestockings. Unfortunately, Frances was convinced by her father and by Samuel Crisp not to have it performed, because they had reservations about the propriety of a woman writing comedy. In 1782, she published Cecilia, or Memoirs of an Heiress, written partly at Chessington Hall and after much discussion with Mr. Crisp. The publishers, Messrs Payne & Cadell paid Frances £250 for her novel. The plot of Cecilia revolves around the heroine, Cecilia Beverly, whose inheritance from her uncle comes with the stipulation that she find a husband who will accept her name. This proves impossible, given the social climate that she lives in, and she gives up her fortune to marry for love. The work received praise for the mature tone of its ironic third person narration, but was viewed as less spontaneous than her first work, and as weighed down by the author’s self-conscious awareness of her own audience . Some critics claim to have found the narration intrusive, while some of her friends found the writing too closely modeled on Johnson's. In 1775, Frances Burney turned down a marriage proposal from one Thomas Barlow, likely on the grounds of his inadequate wealth. From 1782-1785 she enjoyed the rewards of her successes as a novelist; she was received at fashionable literary gatherings throughout London. In 1781 Samuel Crisp died. In 1784, Dr. Johnson died, and that year also saw the failure of her romance with a young clergyman, George Owen Cambridge. She was 33 years old. During her years in court, Burney continued to produce her journals. To her friends and to Susanna, she recounted her life in court, as well as significant political events, including the public trial of Warren Hastings for “official misconduct in India.” She also recorded the speeches of Edmund Burke at the trial . She was courted by an official of the royal household, Colonel Stephen Digby, but he eventually married another woman of greater wealth . The disappointment, combined with the other frustrations of her office, contributed to her failing health at this time. In 1790 she prevailed on her father (whose own career had taken a new turn when he was appointed organist at Chelsea Hospital in 1783) to request that she be released from the post, which she was. She returned to her father’s house in Chelsea, but continued to receive a yearly pension of £100. She maintained a friendship with the royal family and received letters from the princesses from 1818 until 1840. In 1790-1791, Burney wrote four blank verse tragedies: Hubert de Vere, The Siege of Prevensey, and Elberta and Edwy and Elgiva, of which only the last was performed, for one night in London before closing. The French Revolution began in 1789 and Burney was among the many literate English figures who sympathized with its early ideals of equality and social justice. During this period Frances became acquainted with a group of French exiles, known as “Constitutionalists,” who had fled to England in August 1792 and were living at Juniper Hall, near Mickleham, where Frances' sister Susanna lived. She quickly became close to Gen. Alexandre D'Arblay, an artillery officer who had been adjutant-general to La Fayette, who would become a hero of the French Revolution. D'Arblay's political views lay between those of Royalist and of Republicans. D’Arblay taught her French and introduced her to the writer Madame de Staël. Her father disapproved of the alliance because of Alexandre’s poverty, his Catholicism, and his ambiguous social status as an émigré, but in spite of this, they were married on July 28, 1793. The same year she produced her pamphlet Brief Reflections relative to the Emigrant French Clergy. This short work was similar to other pamphlets produced by French sympathizers in England, calling for financial support for the revolutionary cause. It is noteworthy for the way that Burney employed her rhetorical skills in the name of tolerance and human compassion. On December 18, 1794, Frances gave birth to their son Alexander. The struggling young family was saved from poverty in 1796 by the publication of Frances’ “courtesy novel” Camilla, or a Picture of Youth, a story of frustrated love and impoverishment. The first edition sold out; she made £1,000 on the novel and sold the copyright for another £1,000. This money was sufficient to allow them to build a house in West Humble, which they called “Camilla Cottage.” Their life at this time was, by all accounts, a happy one, but the illness and death of Frances’ sister and close friend, Susanna overshadowed their contentment. Susanna died in 1800, and her death brought an end to their life long correspondence that been the motive and basis for most of Burney’s journal writing (though later she did write again at the request of her husband, for the benefit of her son). Between 1797 – 1801 she wrote three unpublished comedies: Love and Fashion; A Busy Day; and The Woman Hater. The latter is partially a reworking of themes from The Witlings, but with the satiric elements softened and more emphasis on reforming characters’ negative traits. The play retains one of the central characters, the Lady Smatter–who was perceived as a comic rendering of a Bluestocking-type of literary woman. All of the other characters differ. In 1801 d'Arblay was offered service with the government of Napoleon Bonaparte in France, and in 1802 Burney and her son followed him to Paris, where they expected to remain for a year. The outbreak of the war between France and England overtook their visit, and they remained for ten years altogether. Although the conditions of their time in France left her isolated from her family, Burney was supportive of her husband’s decision to move to Passay, near Paris. In 1811, Burney developed breast cancer and underwent a mastectomy without anesthesthetic. She wrote a first person account of this experience in her diaries, and it remains one of the most compelling early accounts of the illness and its difficult treatment. She returned to England 1812 to visit her ailing father and to avoid having young Alexander’s conscription to the French army, while still in recovery from her own illness. Charles Burney died in 1814. In 1815, Napoleon Bonaparte escaped Alba. D’Arblay was then employed with the King’s guard, and he became involved in the military actions that followed. After her father’s death, Burney joined her wounded husband at Treves, and together they returned to Bath in England. Burney wrote an account of this experience and of her Paris years in her Waterloo Journal, written between 1818 and 1832. D’Arblay was rewarded with the position of lieutenant general but died shortly afterwards of cancer, in 1818. Burney published her fourth novel, The Wanderer or Female Difficulties a few days prior to Charles Burney’s death. Described as “a story of love and misalliance set in the French Revolution,” the piece criticized the English treatment of foreigners during the war years. She made £1,500 on its first run, but the work disappointed her followers who expected an amusing account of life in French society, and it did not go into a second printing. Critics felt that it lacked the insight that her earlier novels possessed; however, its publication met her immediate needs, bringing her sufficient income to avoid poverty. After her husband’s death, Burney then moved to London to be nearer to her son, who was a fellow at Christ College. As homage to her father, she gathered and published, in three volumes, the Memoirs of Doctor Burney in 1832. The memoirs were written in a laudatory style, praising her father's accomplishments and character, and she cannibalized many of her own personal writings from years before in order to produce them. Always protective of her father and the family’s reputation, she deliberately destroyed evidence of facts that were painful or unflattering, and was soundly criticized by her contemporaries and later by historians for doing so. Otherwise, she lived essentially in retirement, outliving her son who died in 1837, and her sister Charlotte Broom, who died in 1838. Burney was visited in Bath by younger members of the Burney family, who found her a fascinating storyteller with a talent for imitating the personalities that she described. She continued to write to her family often. Frances Burney died on January 6, 1840. She was buried with her son and her husband in Walcot Cemetery, in Bath, and a gravestone was later erected in the churchyard of Saint Swithin's Church across the road. Frances Burney’s early career was deeply affected by her relationship with her father, and by the critical attentions of their family friend, Samuel Crisp. Both men encouraged her writing, but also employed their influence in a critical fashion, dissuading her from publishing or performing her dramatic comedies because they felt that to work in the genre was inappropriate for a lady. Many feminist critics thus see her as an author whose natural talent for satire was stifled by the social pressures exerted on female authors of the age. In spite of setbacks however, Burney persisted in writing. When her comedies received criticism, she returned to novel writing, and later tried her hand at tragedies. She supported both herself and her family with the proceeds of her later novels Camilla and The Wanderer. While some early historians derided the “feminine sensibility” of her writing, her fiction is now widely acknowledged for its critical wit and for its deliberate exploration of the lives of women. Evelina: Or The History of A Young Lady's Entrance into the World, London: Thomas Lowndes, 1778. Cecilia: Or, Memoirs of an Heiress, 1782. Camilla: Or, A Picture of Youth, 1796. The Wanderer: Or, Female Difficulties, London: Longmans, 1814. Edwy and Elgiva, 1790, (verse tragedy). Produced at Drury Lane, March 21, 1795. Hubert de Vere, 1788-1791? (verse tragedy). The Siege of Pevensey, 1788-1791? (verse tragedy). Elberta, (fragment) 1788-1791? (verse tragedy). ↑ Anne Commire, and Deborah Klezmer. Women in World History: a biographical encyclopedia. (Waterford, CT: Yorkin Publications, 1999-2002), 228. ↑ Margaret Anne Doody. Frances Burney: The Life in The Works. (New Jersey: Rutgers University Press 1988), 11. ↑ Julia Epstein. The Iron Pen: Frances Burney and the Politics of Women’s Writing. (Wisconsin: University of Wisconsin Press, 1989), 23. ↑ Encyclopedia Britannica, Vol 4 (Chicago, London: Encyclopedia Britannica Inc, 1971), 450. ↑ Hugh Chisholm. "D'Arblay" in Encyclopedia Britannica: A Dictionary of Arts, Sciences, Literature. (London, 1910), 826, 826. online at. Retrieved December 29, 2007. ↑ The Burney Society "Frances Burney d'Arblay" Retrieved December 29, 2007. ↑ Commire, Anne and Deborah Klezmer. Women in World History: a biographical encyclopedia. (Waterford: Yorkin Publications, 1999-2002) 231. ↑ Pseudopodium  The Witlings. A Comedy. By A Sister of the Order. (Frances Burney, 1779) HTML edition by Ray Davis. Retrieved December 29, 2007. “Burney, Fanny, 1752-1840,” Literature Online biography. Bell & Howell Information and Learning Company (2000). Fredericton N.B. : University of New Brunswick, 2006. Chisholm, Hugh. The Encyclopedia Britannica: A Dictionary of Arts, Sciences, Literature. London, 1910. Devlin, D.D. The Novels and Journals of Frances Burney. Hampshire, UK: Macmillan Press Ltd., 1987. Encyclopaedia Britannica, Vol 4. Chicago, London: Encyclopedia Britannica Inc, 1971. This page was last modified on 21 April 2017, at 14:27.